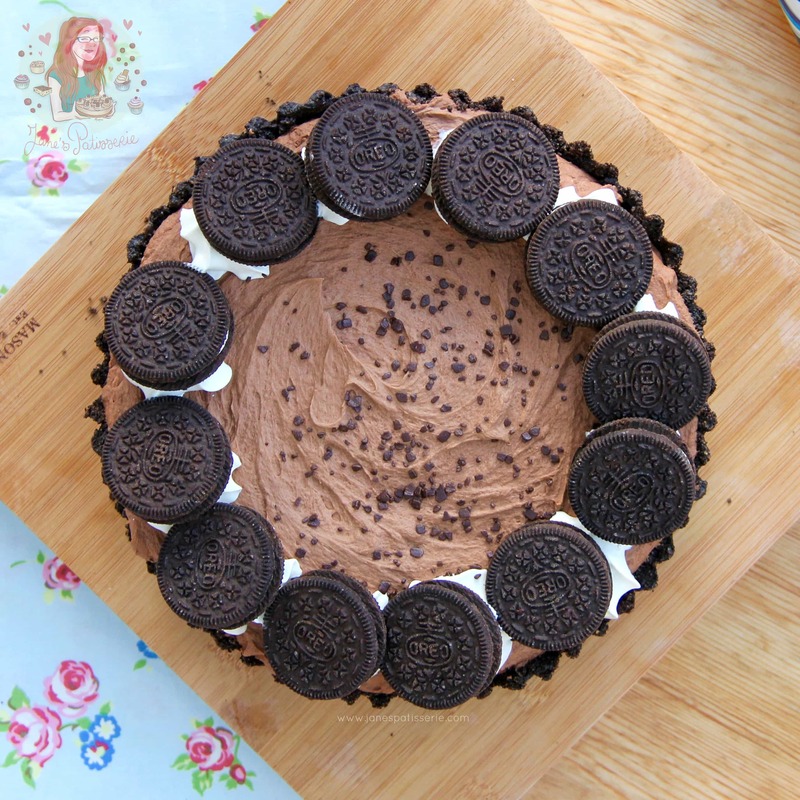 A Crunchy, Chocolatey, Oreo-y No-Bake Dessert – perfect quick make to get over the New Year Slump! I recently received the cutest email asking me for this Recipe, and I had oodles of Oreos in the cupboard… so it seemed silly not to. After the success of my No-Bake Oreo Cheesecake I realised how much you would all utterly adore this recipe, as all of my taste testers certainly did. After the successes of my No-Bake Honeycomb Crunchie Pie and my No-Bake Terry’s Chocolate Orange Tart, I thought I would mash them both up, with oodles more Oreos and make this delicious beauty.. and it didn’t disappoint! 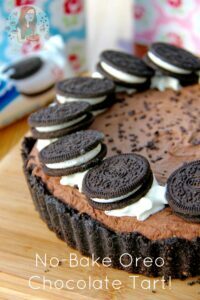 The crunchy Oreo Crust, with a deep Chocolatey crunchy Oreo filling, topped with Cream, and MORE Oreos! 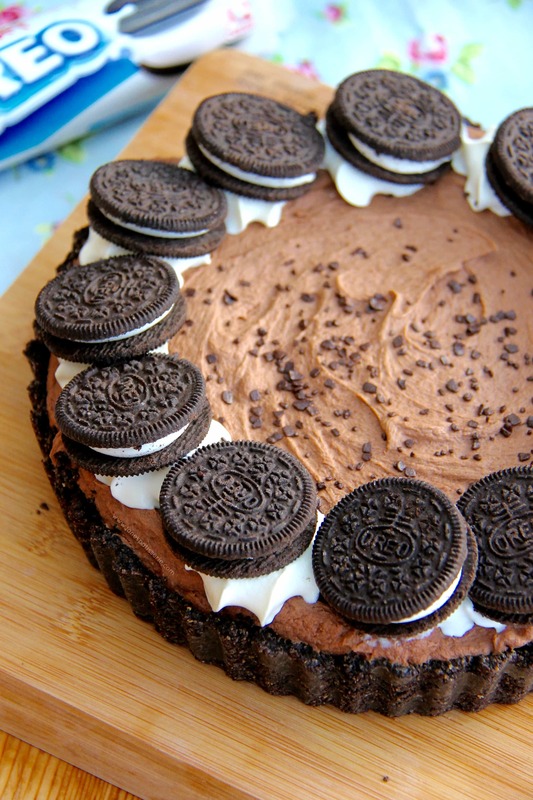 How can an Oreo lover say no to this?! Its heaven! I know these sort of recipes are simple, but the Rise of the ‘No-Bake’ dessert being so massively on the increase, that I can’t resist doing even more! I find its just the ease of it… I used to have massive troubles with my Families oven, so these were my absolute go-to thing to make (when brownies could take 2 hours in the oven and still not bake…) and I can’t stop doing them still now, even with a good oven! No-Bake desserts are quick, easy and so tasty! The lightness of a dessert is increased as you have the fresh cream, without having to add in eggs, or bake it to make a denser texture… you can obviously use all Milk Chocolate, or all Dark Chocolate, or even make it a thick ganache texture in the middle.. but I like lightly whipped cream, mixed in with the two chocolates.. makes the perfect taste to suit the Oreos! Enjoy! 1) For the Oreo Crust – Using a food processor, blitz all of the biscuits to a fine crumb, and mix in the melted butter. Press this into the sides and base of a 20cm Pie/Flan tin (mine was 3cm deep). It might be easier to use your hands and fingers for this! Make sure that the side parts are thick enough to hold once removed. Refrigerate for now. 2) For the Oreo Chocolate Filling – Chop the chocolate up and melt the Chocolate in a bowl over a double-boiler, or in a microwave on short bursts, until melted and smooth – leave to the side to cool slightly. 3) Whip the cream and the icing sugar up to soft peaks, I used an electric whisk as I’m lazy, but a hand whisk is easy enough if you want a work out – you don’t want to over whip the cream as it’ll curdle, so slightly sloppy thickness is good! Fold through the slightly cooled melted chocolate and the chopped up Oreos. Spread this mixture into the crusted pie dish and leave to set for 3-4 hours, or overnight. 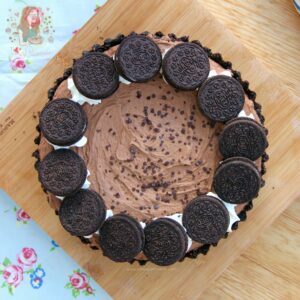 4) To Decorate – Decorate the pie with some whipped cream, Oreos, some crushed Oreos, and some sprinkles – or whatever you fancy!! I use a mix of Milk & Dark Chocolate as it gives a nicer flavour – If you want a stiffer set, then don’t whip the cream up, stir in the liquid double cream into the melted chocolate and it’ll be less moussey! You can easily double up the recipe to make a bigger & deeper pie – add another half of the base recipe (I.e. 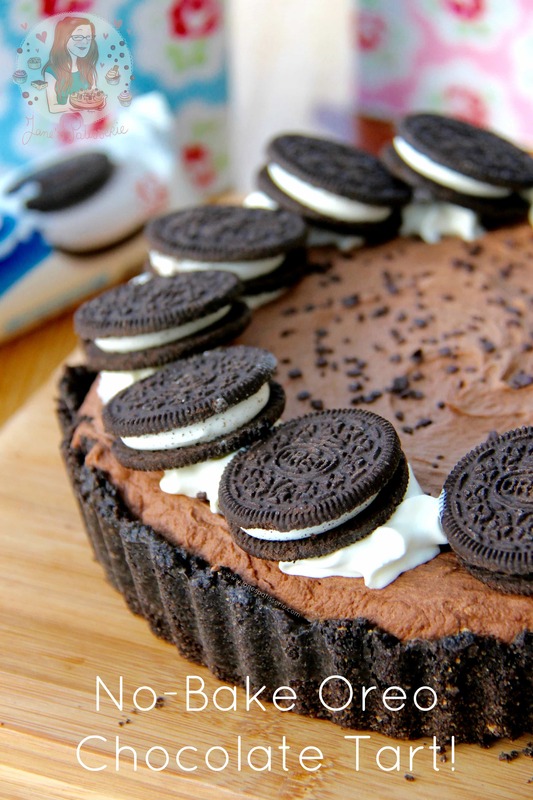 use 3 tubes of Oreos, and 150g butter) and double the filling recipe! Use a 25cmx5cm deep tart tin! This dessert will last in the fridge for 2-3days, covered. Older Next post: Mint Oreo Brownies! Newer Previous post: Gluten Free Vanilla Cupcakes! But you don’t need to bake it… so why would you? These are so yum! and were a win at my dinner party. So delicious. i want to make again but i was thinking could i make a small pie by using half the ingredients. Will it still give same results? As its a no-bake recipe, you can double or half it relatively easily, you just need to make sure theres enough biscuit for the base. 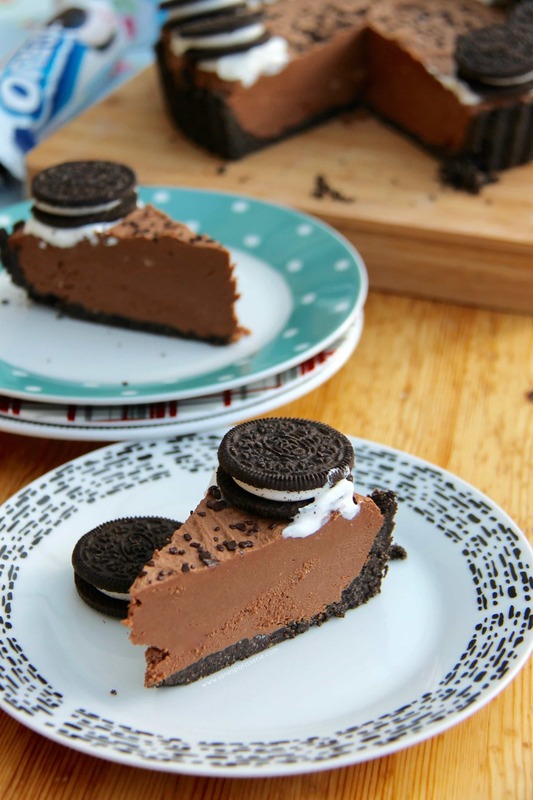 Mmmmmmmm love the idea of this no bake Oreo tart.. You are so talented Jane .. ? All your recipes work too ! Marvellous in this day & age to find some one so precise – keep up the good work & thank you ? 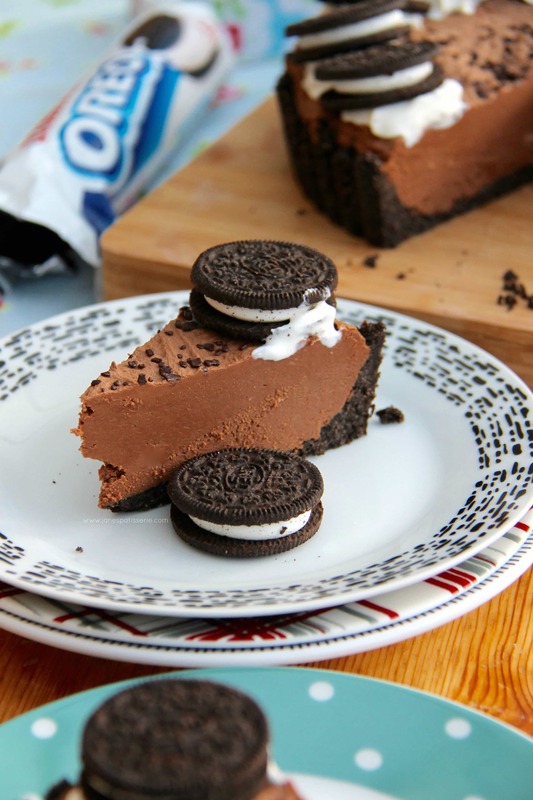 I haven’t tried a no bake dessert yet but I really want to… This looks incredible! Everytime I visit your blog I end up feeling SO hungry but I just can’t stay away! Ohhh you really should!! They’re so easy yet so delicious! Almost tastes better when they’re no-bake! But thank you haha! 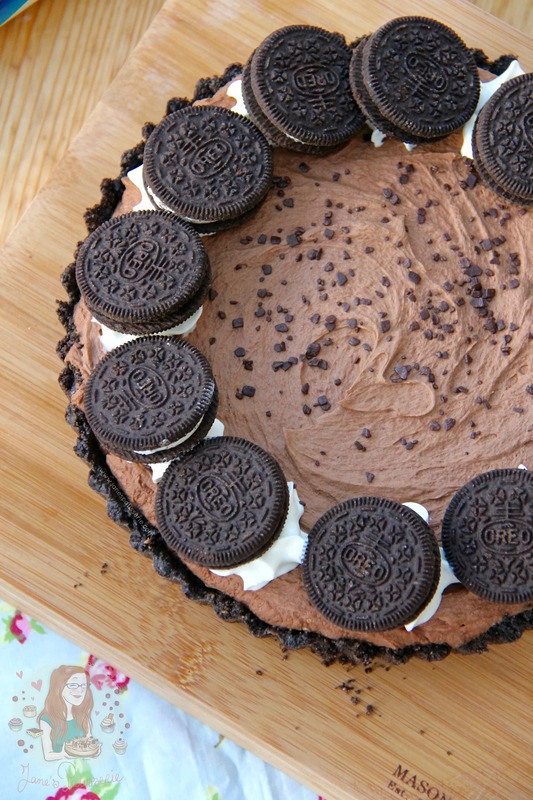 LOVE no-bake desserts! They ARE easy BUT delicious, that’s the best part! No fuss! These are like shortcut desserts that satisfy! Keep them coming Jane, I love these delicious ideas of yours! Exactly! It’s why I’m addicted to making them!! And thank you so much!